This DIY Oil Diffuser from Natalie Pirvey is a great way to reuse an old perfume bottle. 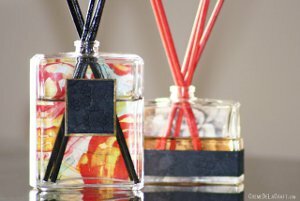 Oil diffusers can fill a room with a beautiful scent without you having to do anything! And the best thing about this one is that you can reuse old perfume bottles, which always seem like a waste to throw away. Keep them in the bathroom or living room as a useful decor item. Pull off the spray nozzle from the bottle. With pliers, grip the round metal piece around the neck of the bottle and pull it off. You should now be left with another metal piece that's adjoined to the neck of the bottle. 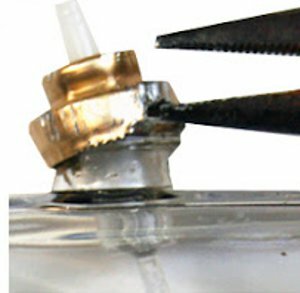 Insert the tip of your pliers under one section of the metal and gently begin to pry upward (tip: this step may take some more time for certain bottles. Try using an x-acto knife or scissors if your bottle is giving you trouble). Repeat this step around the entire neck of the bottle. Once the metal piece has loosened, use the pliers again to pull it out, removing it from the bottle. 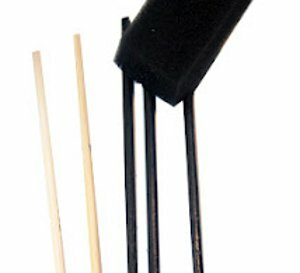 Paint the skewers with acrylic paint using a foam brush. Adhere a little bit of tape to the background paper you have chosen and attach it to the back of the bottle. 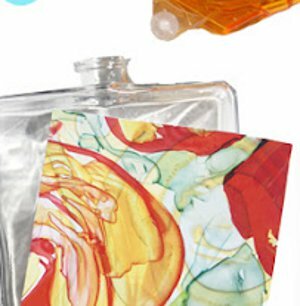 To hide any logos on the bottle, simply add some more decorative paper to the front of the bottle. Add diffuser oil and arrange sticks.